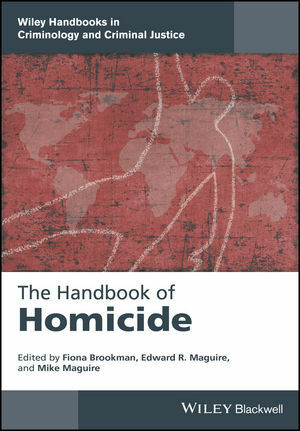 The Handbook of Homicide presents a series of original essays by renowned authors from around the world, reflecting the latest scholarship on the nature, causes, and patterns of homicide, as well as policies and practices for its investigation and prevention. Fiona Brookman is Professor of Criminology at the University of South Wales, UK. She is the author of Understanding Homicide (2005) and co-editor of Handbook on Crime (2010). She has written over fifty articles and chapters on various themes related to violence and homicide. Edward R. Maguire is Professor in the School of Criminology and Criminal Justice and Associate Director in the Center for Violence Prevention and Community Safety at Arizona State University, USA. He has written or edited four books and more than seventy articles and chapters on various themes related to policing, violence, research methodology, and comparative criminology. Mike Maguire is Part-Time Professor of Criminology at the University of South Wales, UK and Professor Emeritus at Cardiff University, UK. He is co-editor of The Oxford Handbook of Criminology (5th edition, 2012), and is a long-standing member of the Correctional Services Accreditation and Advice Panel.